Few things evoke the atmosphere of a fairy-tale romance than some of Europe’s numerous beautiful castles. Sometimes looking like they have just stepped straight off a page of an illustrated children’s book or surrounded by a sinister aura of mysticism, the many castles scattered across Europe cover a huge historic period, boasting an extensive range of different architectural styles. Some castles were built to serve primarily as huge military fortifications while others were built as luxury palaces and châteaux for the wealthiest and most prestigious royal and aristocratic families of Europe. No trip to Europe would be complete without a visit to some of its magnificent stately homes or majestic castles, and this guide takes a look at just ten of the best. Neuschwanstein Castle is one of the most famous castles in the world as well as one of the most visited sights in Germany. This stunning Romanesque Revival Palace stands proudly atop a hill, overlooking the Bavarian countryside. Built in the late nineteenth century as a second home for Ludwig II of Bavaria, the palace was opened not long after his death in 1886. This stunning exemplar of a fairy-tale castle now receives around 1.4 million visitors every year. 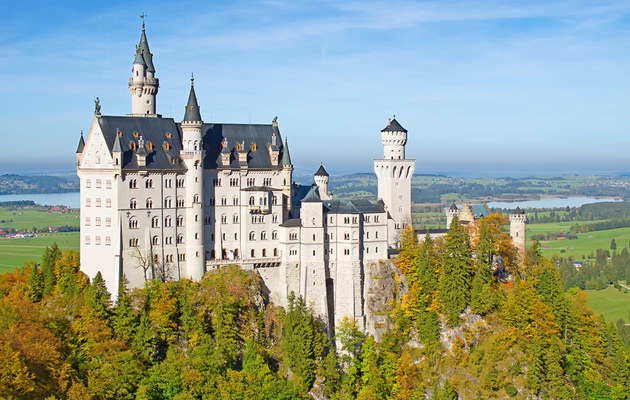 Visitors to Neuschwanstein Castle will need to purchase their entry tickets in the village of Hohenschwangau, at the foot of the hill, and it is necessary to take a thirty-minute guided tour. Opening hours are 9 AM until 6 PM from April to mid-October and 10 AM to 4 PM during the winter months.